Video Game / Irisu Syndrome! Meet Irisu, Bunnygirl Witch Extraordinaire! 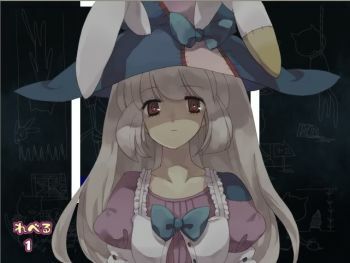 A freeware Japanese puzzle game starring a cute bunny girl, Irisu Kyouko. There are shapes of various colors falling down. Use your mouse to launch white blocks to make the shapes collide with another of the same color to score points and regain health. Can be downloaded here , and there is a fan-made English patch here . As you progress through the game gaining more and more points, you can unlock various scenes involving three university students out on a camping trip. Of note is an old story one of them tells about a witch in the area. See also Ai To Yuuki To Kashi Wa Mochi, another puzzle game by the same creator. All There in the Manual: The backstory of the game and its characters can only be found in text files created in the game folder. More text also appears when clicking on images in the CG gallery — this is also how some of the text files are created. Art Evolution: In addition to the nicer-looking interface, Metsu also has improved shading. Bunnies for Cuteness: Irisu! Or Is It? Expansion Pack: Metsu, an updated version with an alternate gameplay mode and updated graphics. Falling Blocks: You have to use your mouse to get the falling blocks to hit another of the same color before they're "set" on the ground. Alternately, get two or more falling blocks to touch each other in midair, and they'll glow and give you a bigger bonus. Game-Over Man: Irisu greets you every time you get a game over. Idiot Hair: Ageha has two, but she's not really that much of an idiot, being more of a Genki Girl. Multiple Endings: Just two in the initial game, the Expansion Pack adds another. Nintendo Hard: If you don't know what you're doing, your game will end very, very fast. Have a falling block land on a matching block on the ground, destroying both. Send a fallen block up to collide in mid air with a matching block (does not have to be glowing). Cause two glowing blocks to collide in mid air, causing them both to glow even brighter and explode harmlessly when they hit the ground. White and grey blocks stay on the ground afterwards, but are destroyed by glowing colored blocks slamming through them. Using the scroll wheel speeds everything up a little. Holding the space bar speeds it up a LOT. You lose health every time a glowing block lands, and gain it whenever you cause blocks to vanish. Your health also depletes gradually over time. You can launch blocks off the sides of the screen, which destroys them but does do a slight amount of health damage. More colors appear as the game progresses. Flashing "bomb" circles occasionally appear, which when hit with a glowing block will destroy all blocks of the same color. Like Tetris, the game level goes up as you play. Older Than They Look: Although the characters are university students, the art style makes them look as if they're still in junior high. Puzzle Game: Incredibly simple, but still very hard. Scary Surprise Party: Happy birthday, Ageha! Haha, that sure was some prank, huh? There's more to it than that. Sequel Hook: Some plot threads don't seem to be concluded properly, so it's possible that a sequel may appear. Scoring Points: The game is based around doing this - many events, including unlocking Metsu mode, are only triggered by reaching certain scores. ¡Three Amigos! : Edogawa, Uuji, and Ageha, the three university students. Widget Series: If you can't read Japanese, you can still play it, but you will miss out on the story. Fortunately, someone already made a project to translate this game in this link. Here is the latest patch. ... Wait, where'd Edogawa go?